FRANKFURT (Reuters) - Ford and Jaguar Land Rover unveiled sweeping job cuts across Europe on Thursday as carmakers struggle with a slump in demand for diesel vehicles, tougher emissions rules and a global economic slowdown led by China. Tata-owned JLR, based in central England, said it will cut 4,500 out of 42,500 jobs, while Ford said it will slash "thousands" of jobs as part of an overhaul that could result in plant closures and the discontinuation of some models. A trade war between China and the United States combined with Britain's pending exit from the European Union has fragmented once global markets, forcing carmakers to reassess the profitability of individual models and locations. In recent quarters, JLR and Ford's profits have lagged behind those of peers BMW, Volkswagen and Peugeot, ramping up investor pressure on managers to stem losses. "We are taking decisive action to transform the Ford business in Europe," Steven Armstrong, group vice president, Europe, Middle East and Africa, said in a statement on Thursday. Ford Europe, which employs 53,000 people, has been losing money for years and pressure to restructure its operations has increased since arch-rival General Motors raised profits by selling its European Opel and Vauxhall brands to France's Peugeot SAC. "The economic slowdown in China along with ongoing trade tensions is continuing to influence consumer confidence," said Jaguar Land Rover Chief Commercial Officer Felix Brautigam. "We believe Ford Europe could require as much as a 20 to 30 percent reduction of capacity and headcount," Morgan Stanley analyst Adam Jonas said in a note on Thursday. "We want to be a net contributor of capital and not a net detractor," Armstrong told journalists on a later call, referring to Europe's financial contribution to U.S. parent Ford Motor. Ford Europe reported a 245 million euro (£221 million) loss before interest and taxes in the third quarter, equivalent to a negative 3.3 percent EBIT margin. Diesel accounts for 90 percent of Jaguar Land Rover's British sales and 45 percent of global demand, the company said last year, as demand tumbles following new levies in the wake of the Volkswagen scandal. Ford's Armstrong said pressure to build electric and hybrid cars had forced the carmaker to make choices about where to allocate its capital. 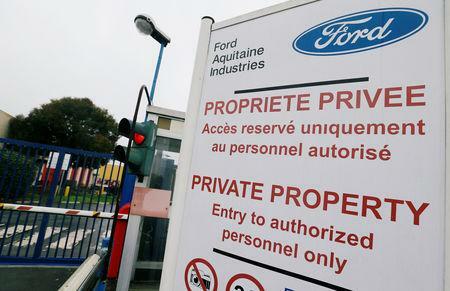 Armstrong said any Ford layoffs and plant closures would be subject to negotiations with labour representatives, and such plans did not account for the possibility of a 'hard' exit by Britain from the European Union. "If Brexit went in the wrong direction we would have to have another look, to mitigate that," Armstrong said. A Ford spokesman said the carmaker currently assumes that any Brexit deal would keep tariff-free trade between Britain and Europe. "I don't want to make at the moment any statement about Brexit and/or the closure of the plant or further implications out of it not knowing the results from politics. We have to know first what is going on."